Every year Block by Block Organizing Network District 7 (BBBON D7) holds a service event in District 7 to commemorate Martin Luther King Day. In 2016, BBBON D7 continued this tradition by hosting a planting and cleaning event on G-Street (between 85th and 92nd Avenues). For over the past two years, BBBON D7 and HOPE Collaborative have partnered to reduce blight on G-Street. Heavy illegal trash dumping was identified by hundreds of Elmhurst residents as a community concern and health impediment during the develop ment of the Elmhurst Neighborhood Plan. Responding to this neighborhood need, HOPE Collaborative has partnered with BBBON D7 to host regular service activities on G-Street. Some past accomplishments include planting approximately 30 trees on G-Street, installation of motion lights and door-to door-outreach to residents and businesses on and nearby G-Street. This work has been made possible by two rounds of mini-grants administered by HOPE Collaborative and funded by The California Endowment.This year’s event built on past efforts by focusing on bringing local attention to the activities on G-Street and installing five large planter boxes on G-Street. Ideally, bringing additional greenery to G-Street will decorate and beautify the area while also acting as a blight impediment. Overall, 50 individuals participated in the event. 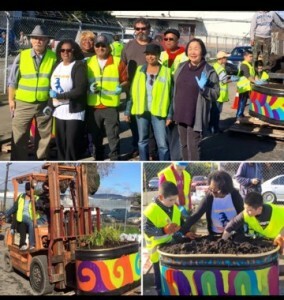 Together, folks collected 97 bags of trash, and 5 big planter boxes were painted by kids who live in the neighborhood working alongside local artists at NIMBY. 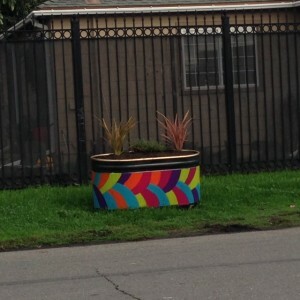 The planter boxes are now located throughout G-Street. 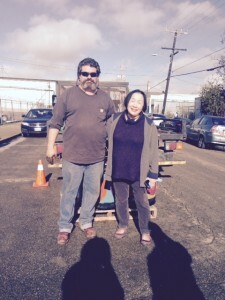 The event was a success due to the diverse groups who volunteered. Thanks to everyone who participated, including the local youth (11 in all) and their parents who helped decorate the planter b oxes, NIMBY, Oakland Catholic Workers, Youth Action Board and HOPE members, OUSD school board member Shanti Gonzales and former Mayor Quan, and of course, BBBON D7 for organizing the event. Thanks as well to the Oakland Public Works Department for the tools and materials. 30-8:00pm at Allen Temple Baptist Church, Family Life Ctr. 2nd Flr., end of the hall) please contact Sheryl Walton of BBBON D7 or Ruben at ruben@hopecollaborative.net or 510.444.4295. This entry was posted on February 18, 2016 at 12:53 pm. You can follow any responses to this entry through the RSS 2.0 feed. Both comments and pings are currently closed.